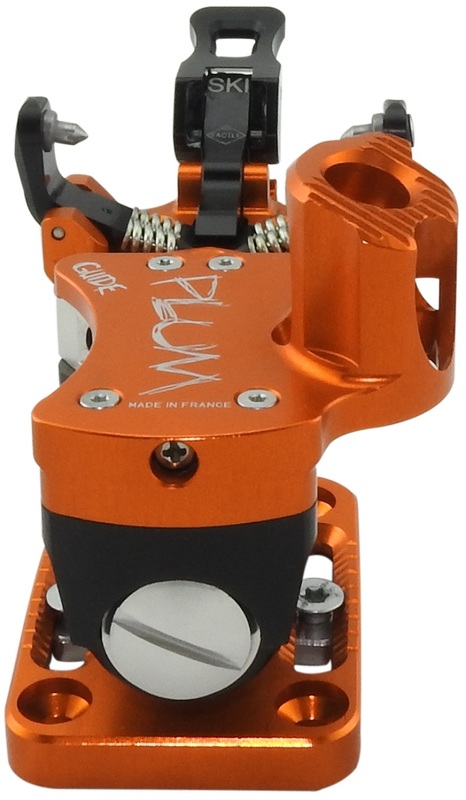 Take a proven design, add higher release values and more adjustability, and you get the Plum Guide binding. Crafted in France with extremely accurate CNC machines, the binding echoes the classic TLT Speed that has proven itself reliable for more than a decade. However by using aerospace grade materials, Plum was able to increase the overall strength and dial up the max release value to 12. And with 30mm of boot sole length adjustability, the Guide can adapt to roughly 4 full sizes, making for very flexible mounts. If you're looking for a sturdy, lightweight binding with simple operation, Plum may have found the answer. Machined with aerospace grade aluminum, steel, and polyvinyl to achieve tangible strength and rigidity. Lateral and vertical (forward) release values can be adjusted between a range of 5.5 and 12 (similar to DIN values). Two riser heights (in addtion to flat) can be engaged by rotating the heel piece with either hand or a pole. 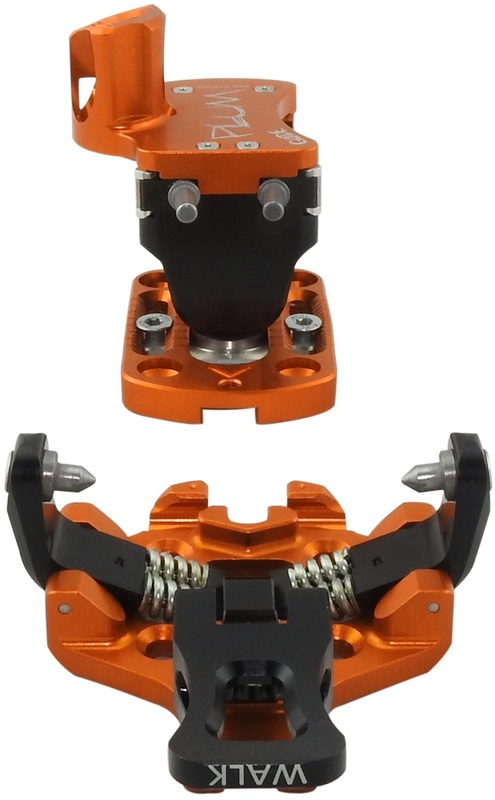 Heel adjusts forward and backward within a 30mm range so the same mount can accommodate 4-5 full boot sizes. Front lever flips between fully-locked uphill and releasable ski modes, with a handy inscription so you know which mode you're in. Toe piece features a ski crampon receptor so you can get extra traction while skinning snow ice. Same mounting pattern as the Dynafit Speed, Comfort, and Vertical series so you may be able to use existing drill holes. Leash included to help prevent lost skis or angry patrolmen (brakeless versions only). Update 15/16: Plum now offers integrated heel brakes with the Guide binding, choose from 90mm, 110mm, or 130mm. The brakes have a locking mechanism designed to prevent deploying when skinning uphill. Also Plum is now making ski crampons which can be dropped into the top of the receptor instead of slid in from the side like the others. Update 17/18: Plum added a new orange color. Brake widths changed to 85mm, 95mm, 105mm, 115mm, or 135mm. Binding remains solid. Between SkimoCo's detailed product specs and the generous number of questions/reviews on this page, I'm not sure how much I have to add to the conversation about the Guides. They're a long-standing, well-tested binding from the company that is, in my opinion, the most trusted name in tech bindings. I recommend the Guide to friends who are new/newish to ski touring and need the usual accoutrements (brakes, risers, adjustable release values) and aren't ready to use race bindings quite yet. I have yet to see an uptick of Guide clampers on the local skintracks compared to, say, Ions or Speed Turns, but the Plum evangelism continues...if only because the orange/purple anodizing colors are so much cooler than anything Dynafit or G3 makes! For myself, running brakeless Guides on powder skis (DPS Wailer 106s) for the past year, I've had a flawless experience with only one complaint: ramp angle. The SkimoCo chart lists the Guides at +18mm delta for size 27 boots, which is 3-6mm more than most comparable models, and 14mm more than Race 170s! Now, you could debate ramp angles all day, and I don't think that a low ramp angle (like on the Race 170s) would be ideal for powder skis with tip and tail rocker, at least not for me. But 18mm delta is just too much -- even for size 30/31 boots! -- and leads to some wild quad fatigue and some surprise rocker throw sensations when skiing harder snow. So, despite the buttery-smooth mechanics of the Guides (both toe and heel) and well-designed adjustable release, I'm steering away from the Guides and back toward the Wepa/Oazo as a good middle ground with lower ramp angle. converting the original no-brake Plum guide to integrated brake/ baseplate: How much dis-assembly/ re-assembly is required? Do I need to open up the top plate and do I risk springs a-flying? Hi Doug, it's not too hard if you're changing the whole baseplate. You need to back the lateral release screw-cap all the way out, remove the internal springs (they will be decompressed at this point so won't go a-flying) and bushing, and pull the housing off. 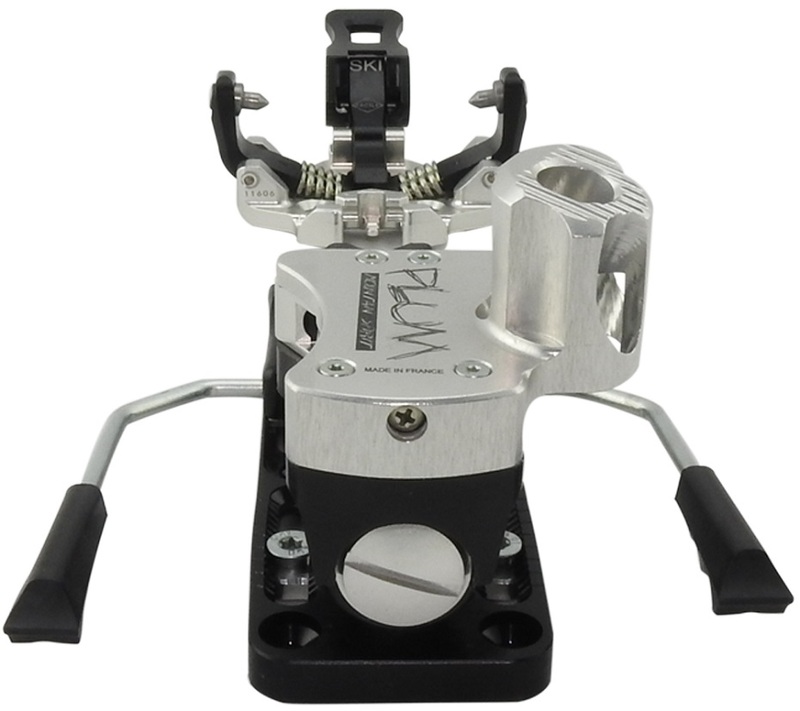 Simply reverse those steps on the new baseplate, being careful not to cross thread the lateral release screw-cap. A great binding. 341g vs 363g for the Speed Radical. That is not the important differece. The big differences are (1) the tower allows swiveling the binding back and forth to dislodge snow built up under the heel--a major peeve of mine; (2) it is easier for me to change lift settings; (3) I never had the heel piece rotate while climbing, whereas all my Speeds (every version) would rotate and I would snap into down hill, requiring removal of the foot from the ski and placing one in a precarious position on the sidehill. Bindings look good too. I bought them with front brakes and stomp pad to get a low delta for use with my TLT5 and TLT6, worked fine but I had to use the black accessory tongue with the 6. When my liner wore out, I bought Scarpa F1s and found the delta too low (I was in the back seat) and removed the brake and stomp pad, resulting in a pefect delta for the F1 in the lower forward lean (and, of course, significantly less weight!). This binding has advantages over the Superlites--more heel lifts, adustable RVs for lateral and vertical release, and greater delta--the benefit of this last one depends on the boot; too much for the TLT6 just right for the F1. The Guides are better lookning than the Speed Radicals, too. Do these bindings come with a mounting template? Does the overall durability (especially of the toe piece) compare well with current Dynafit products? Hi Ryan, they don't have a printed template included but we can send you an electronic version with your order. We've seen very few problems with the Guide over the last few years. In fact, Plum is so confident it will hold up, they just increased the warranty to 5 years! Does plume have a rear platform spacers like the ATK freeride spacer to help stabilize the boot heel? Hi Gem, yes they are available here, listed as Guide Heel Pads. 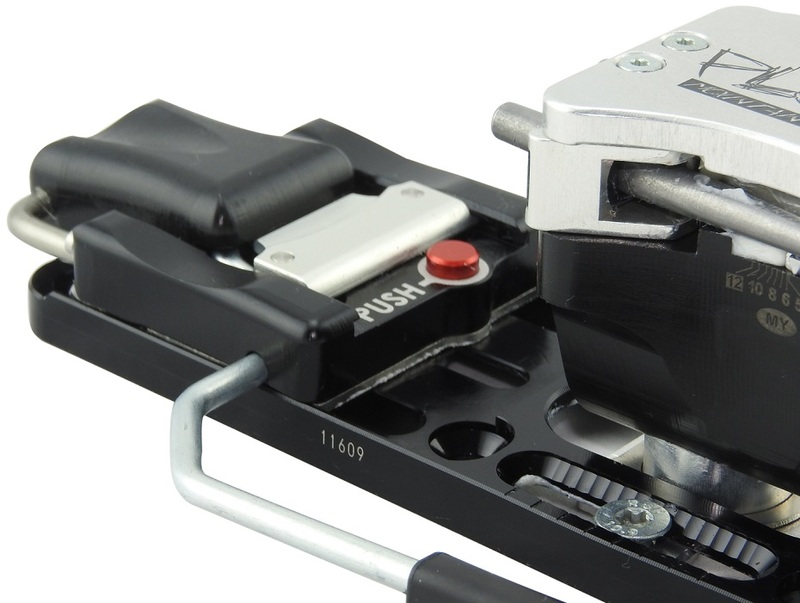 We have Plum brakes listed here, but please note you need the brake-compatible baseplate to use them. I have the older Guides. Currently they are mounted on a pair of BD Justices 185 115mm underfoot. They are great for hiking but, I'm looking at getting new, wider sticks. I see the new Guides have breaks up to 130mm. How wide is too wide for my bindings? Hi Jon, there are no hard and fast rules, it can depend on your skiing. If you are worried about it, you could check out the yak which is a similar binding built specifically for wider skis. Hope that all is well. Question - Would the Plumb Guide work with Voile V8 186Cm / 115 underfoot ? Hi Tony, yeah no problem. You could go brakeless or likely fit the 110mm brakes on it. Thank you the quick respone. Awesome . The V8 is fairly light for its size, just wanted to make sure that the Guide would be able to drive it . I'm not a "charger" ski style wise. Just lots of touring backcountry and sidecountry stuff. Sounds like the Guide/ V8 would be a great combo. One additional ? I have a Jigarex mounting jig. Jigarex offers a couple of mounting plates for 1 or 2 Plum bindings. However , they dont list a hole pattern plate for the Guide specifically. Are Plum hole patterns all the same across their models? Hi Anthony, the hole patterns vary per model. See our list of hole patterns for more info. 1. OK with 83mm waist skis? 2. I will have to mount myself or local ski shop. What about templates and mounting specs? 3. Will they work with my Dynafit TLT 4 Pro's? Currently using Dynafit Comfort binding. 4. Any issues to consider with a more 'modern' boot like the Arcteryx Procline? 1. The 90mm brakes will work fine on those skis. 2. We have paper templates available. 3. Yes, these will work with just about any boot with standard tech fittings. 4. No problem there either! My skis are 87mm underfoot so the 90mm brake would be fine, but if I change my skis in the next few seasons for something wider can I just replace the brake, or do I need to get an entire new heel unit. 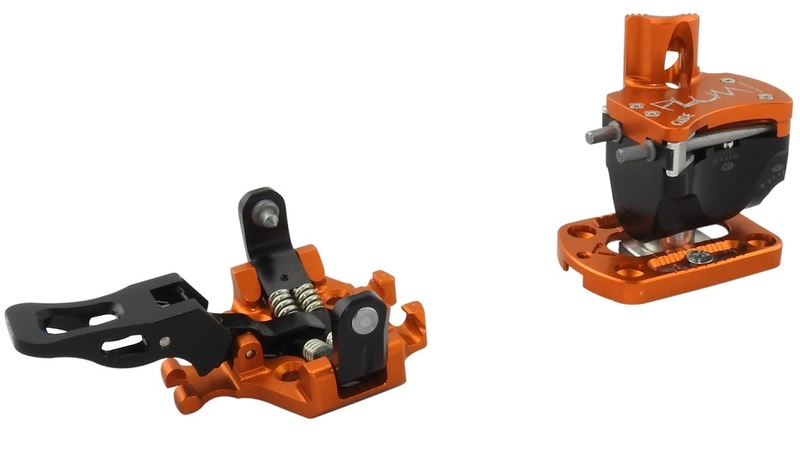 Hi Mark, the brakes are integrated into the base plate, so you'd need a whole base+brake which cost around half of a heel unit. I have an older pair of Guides (silver toe wings, year?) Do these bindings utilize the same hole pattern? Hi Mike, yes the hole pattern hasn't changed since that version. 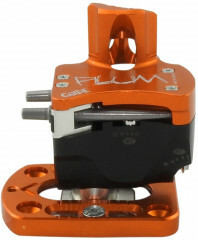 Can you tell me if Plum Guide bindings have the same screw mounting pattern as dynafits? I have Dynafit Stoke skis with preset screw placement - wondering if Plums will match. Hey Richard, each brand has its own proprietary hole pattern and they generally don't like to share. We have a Hole Pattern Recognition article where you can see the hole pattern compatibility if you have any further questions. Hi Richard, the Plum heels match Dynafits, no problem there. The toe patter uses the old Dynafit Vertical pattern, minus the front-most hole. You're likely in luck with that combo. Will this plum work OK with the rocker sole of LA Sportive Sceptre v1 ( black ones). Will brakes work with this boot or should I go with brak-less version? Used on Movement Vertex, got the ones with brakes. I have brakes on none of my other skis, but wanted one pair with them, also because I like the higher heel plug for an all-around ski. Skied for a few days at Snowbird, so have not really worked this in the BC as yet. My first impression is that Plum has a very refined design - the bindings are easier to get into than most dynafit-type ones I've used or own. The brake locks in the up position (so it's out of the way when touring), which is also handy for waxing or other times when you want them out of the way. It does not appear they can easily be removed, so be sure you want brakes if you get them with them. I had no play or pre-releasing, and use a modest DIN setting, but obviously this requires more time to confirm. 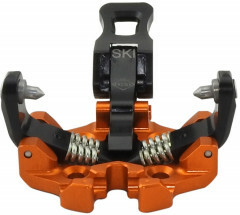 This is a very carefully and well made item - even the crampon attachment is a step up from the normal dynafit type, dropping in from above as opposed to sliding in from the side. More to come with more use. Updated. I've had plate movement twice, likely due to the 2 screw adjustment plate. Brian at skimolife is a better source of details. https://www.instagram.com/brian.skimolife. Admittedly it slipped after late season skiing on Crouches berard but I didn't do as much stream and turf skiing as the locals who passed me. Even after tightening that morning they slipped in shrubbery terrain. Will likely locktite a bit next year. Also a great reason to bring a posi multi tool and bits along. thank you for your ongoing advice about the right bindings for the Big Fish X. I understand the Plum Guide binding has lateral and vertical release, whereas the Superfit 2.0 only has a lateral release. I am not exactly sure what the difference is and whether there is a safety implication for only having lateral release. What is the additional risk, considering I am only a moderately good skier? Also I see the Superlight 2.0 only has two riser heights (to 47mm) and no "flat" option. Does it definitely not have a flat option - seems odd? The Plum Guide on the other hand top riser is 87mm, presumably better on steep slopes? As a moderate skier would perhaps the Plum Guide be better for me? For information, I am looking to buy the Big Fish X skis and bindings to race in the PdG in April (but also use recreationally afterwards). As a moderate skier (from England) I am expecting to complete in a time of 14 hours. I wonder if that has any effect on your recommendation. Hi Joss, the Superlite 2.0 has a forward release, it's just not adjustable, meaning it may or may not be appropriate for your height, weight, age, boot sole length, and skier type. You can turn the heel sideways for a flat more which seems to work reasonably well, but there is no detent so the heel piece may bet accidentally turned into ski mode if it gets hit by your boot. The highest risers can be a bit more efficient on some slopes, but lighter the better for a 14 hour race! Hi Joss, in that case I would just get the Plum Guide with the integrated 90mm brake. Hi Joss, Dynafit makes their brakes a bit wider than advertised; I tested one on the big fish and it works. The brakes are not compatible with the Plum Guide, I was suggesting the Superlite 2.0 as a good binding for that ski. 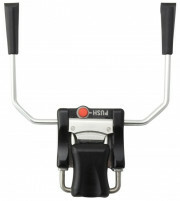 I am looking to buy Movement Big Fish X skis and Plum Guide M binding. The Big Fish has a waist of 77mm. Can I get the 75mm Kreutspitze brake or do I have to get the 90? I'd prefer a narrower brake but will 75 be too narrow for that ski. I have Scarpa Alien boots. Does anyone foresee any set up issues here? 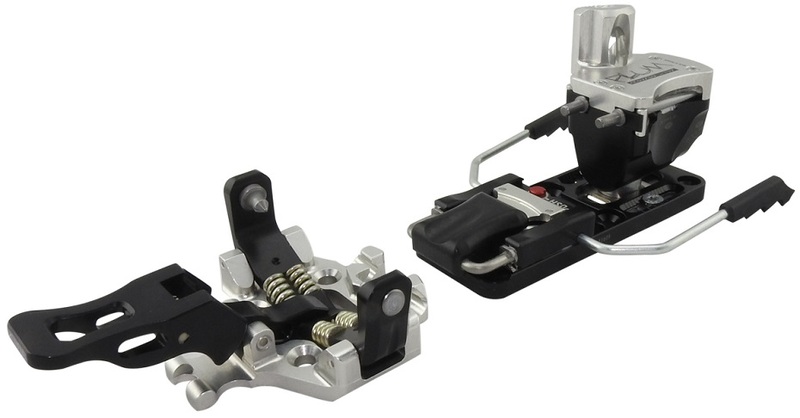 Hi Joss, the K brakes don't have a lot of wiggle room outside their stated spec. You can bend them but that's not ideal. Note the Superlite 2.0 75mm brakes fit well on that ski. Can I get the 130mm brake solo?  Hi Heather, unfortunately the brakes are only sold integrated with the binding. How is durability on the current version of the Plum Guides.? I had an older generation that developed slop in the heel pins; I got rid of them after this problem repeated it self a couple of times despite being repaired. I also heard this generation had problems with the toe wings but I did not have that issue. My current pair is two years old with the black toe wings and have been going strong; should I expect any issues with them? I am thinking of getting another pair; they now have integrated heel brakes from what I hear. Can I get the still get the Guides without the brakes? I don't use brakes on my tech setups. What is the ski crampon compatibility with the guides? My Dynafit brand ski crampons work with the my Guides, but don't fit as smoothly in the ski crampon slot on my Guides as on my Vert St's; the Guides tolerances seem much tighter in this regard. Are the Plum ski crampons a better fit than the Dynafit crampons for the Guides? Hi Harpo, we haven't seen any slop in recent years; Plum would be able to tell your generation with your serial number. Yes the Guide is still available without brakes. The Plum crampons work more easily in the Guide than the Dynafits, since you can just drop them in the top instead of sliding them in from the side.